For years, U.S. officials have ritually complained that China's currency is undervalued and that the country should let it appreciate. But President Obama soft-pedaled the problem at the White House summit with President Hu Jintao last week. Why? Washington is quietly celebrating that fact that Fed Chairman Ben Bernanke has outsmarted the Chinese government, forcing it to revalue its currency or face increasing domestic unrest. "No U.S. official will admit this, but Bernanke has succeeded in breaking the Bank of China in the same way George Soros broke the Bank of England in 1992," says James Rickards, senior managing director for merchant bank Tangent Capital in New York. "The U.S. has won the first round of the currency war." He adds: "People forget that one of the factors that caused the Tiananmen Square protests of 1989 was popular discontent with inflation, and the Chinese leadership doesn't want anything like that." How did Bernanke pull off the magic trick that previous U.S. administrations were unable to accomplish? Last fall, he announced a program of quantitative easing -- a federal bond-buying program -- which was targeted, he said, at raising U.S. inflation to head off possible deflation. But in reality, it had a completely different result: Money poured out of the U.S. and flowed into China. According to Adam Wolfe, research analyst at Roubini Global Economics, the amount of so-called hot money entering China reached $1 billion a day in 2010. Coming on top of China's massive trade surplus, those inflows presented a dilemma for the Bank of China. 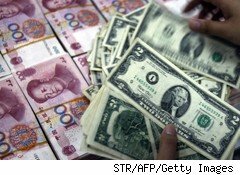 In order to maintain its exchange rate with the U.S. dollar, which was fixed after 2008, the Chinese government bought dollars from exporters and banks and printed local yuan for each dollar it purchased. But last fall, the supply of yuan skyrocketed, increasing by 19.7% in December, Wolfe says. Increasing the money supply causes prices to increase as more money chases fewer products. Chinese inflation had ramped up 4.9% in November, compared with the same month in 2009. China has attempted to keep a lid on prices by cooling the economy, raising interest rates twice last autumn. But that prescription has failed. According to fourth-quarter GDP figures, the economy grew by 9.8%, raising the likelihood that the Beijing government will have to slam even harder on the economic brakes. It has just two ways to limit prices: impose price controls or raise the value of the yuan, which reduces the price of imports. Price controls rarely work for more than a short time because people find ways around them, such as the black market. It now seems likely the Chinese will opt for raising the yuan's value. Since last June, the currency has appreciated about 3.5%, or an annual rate of about 7%. When you add inflation, that's 12%. Wolfe says he expects the same level of appreciation for 2011, while Rickards says he sees the yuan rising by at least 10%. For investors, the yuan is a good one-way bet because it's highly unlikely to come down anytime soon. China might feel some resentment about its position. "The Chinese feel betrayed by the U. S.," Rickards says. "They feel that part of the deal for buying all those Treasurys was that the U.S. would maintain the value of the dollar. There's an old saying, 'if you're in a poker game and you don't know who the sucker is, then you're the sucker. The Chinese have just woken up to the fact that they're the sucker."